This black stainless steel rope bracelet will expose your smart and strong personalities to everyone. However, it does not mean that everyone would think that you are selfish and arrogant because the peace symbol in the middle of the bracelet shows people how you respect them equally. 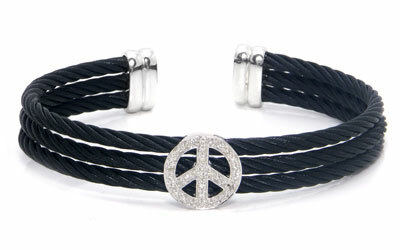 To complete the whole look on the bracelet, diamonds are added on the peace symbol, creating a terrific style on you.